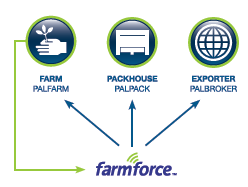 Farmforce is a cloud-based platform for managing farming activities, establishing traceability and ensuring compliance. With the Farmforce app installed on their smartphones or tablets, users in the field can quickly and accurately record information about farming activities – including planting, fertilising, harvesting, selling and more. This information, and the visibility is provides, can be shared with other authorised users on their mobile devices or personal computers.